Compiled by Frank Phillipson with Acknowledgement to Rudgwick Preservation Soc. 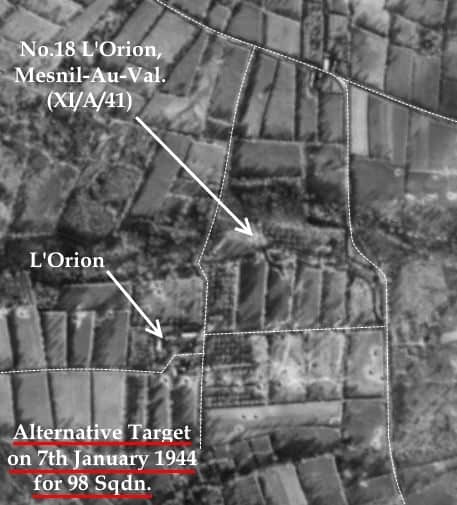 98 Squadron on Alternative Target (because of cloud over the Primary) a V1construction site at “XI/A/41,Mesnil Au Val”(No.18 L’Orion) at 12:55hrs from 12,000ft. Crew members of both aircraft were all killed. Aircraft ‘FR396/K‘ (Fooks) of 180 Squadron and ‘FL682/N‘ (Riordan) of 98 Squadron were not noted as having or not having dropped their bomb load. Aircraft ‘B’ and ‘X’ of 180 Sqdn. and aircraft ‘V’‘P’‘S’‘U’ and ‘X’ of 98 Sqdn. did not bomb due to cloud cover obscuring the targets. Each aircraft carried 8 x 500lb Medium Capacity bombs. 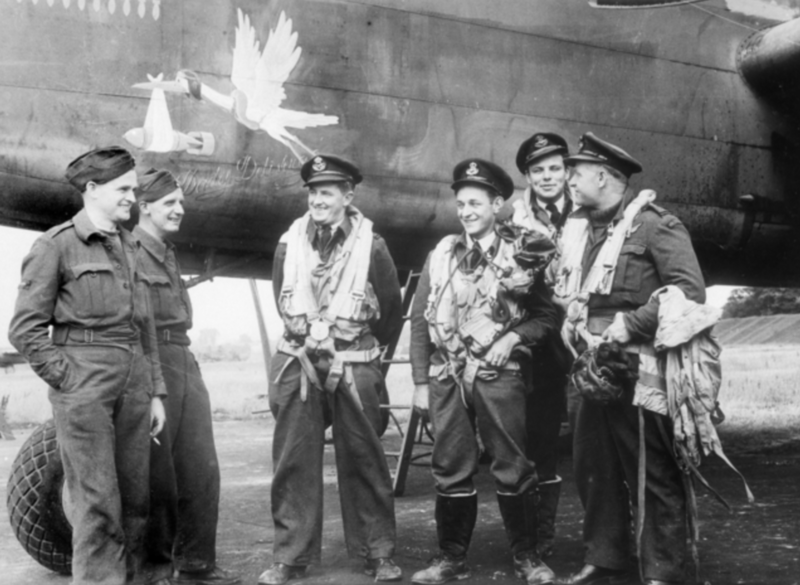 Therefore more aircraft of 98 Squadron (5) failed to drop their bombs than those of 180 Squadron (2). An account of excavation of the two crash sites carried out in the 1990’s records that: – “Pieces (were) recovered from the area of what had been the orchard on the edge of the (lower) football pitch. This aircraft must have come down flat as it did not penetrate the ground to any depth, (and we) thought it had burnt on the surface. The other aircraft dived into the ground in front (north east) of the building (stables),(in the) area of the big bush (rhododendron), but (we) didn’t investigate as area had been landscaped”. there was seemingly no explosion with this aircraft when it hit the ground, were defused by RAF bomb disposal team after the crash. The other Mitchell ‘FR396/K‘ (Fooks) of 180 Squadron dived straight into the ground 200 yds north-east of “Pallinghurst” on the County Boundary near the stables. 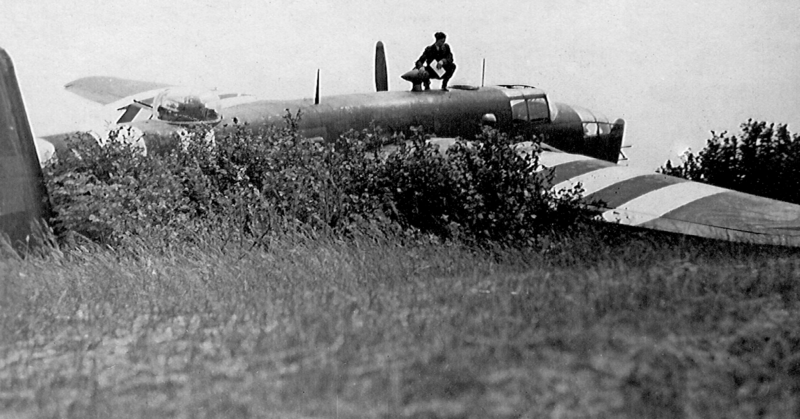 The aircraft had probably not dropped its bomb load due to cloud cover obscuring the target. One or more bombs exploded, either when the aircraft hit the ground or fell out and exploded nearby as the aircraft descended. Other unexploded bombs were defused. Witness: – Emily Harwood (nee Covey) b.1923, daughter of the Gamekeeper (Ernest Covey) to the Pallinghurst Estate, owned by Ernest and Katharine MacAndrew. 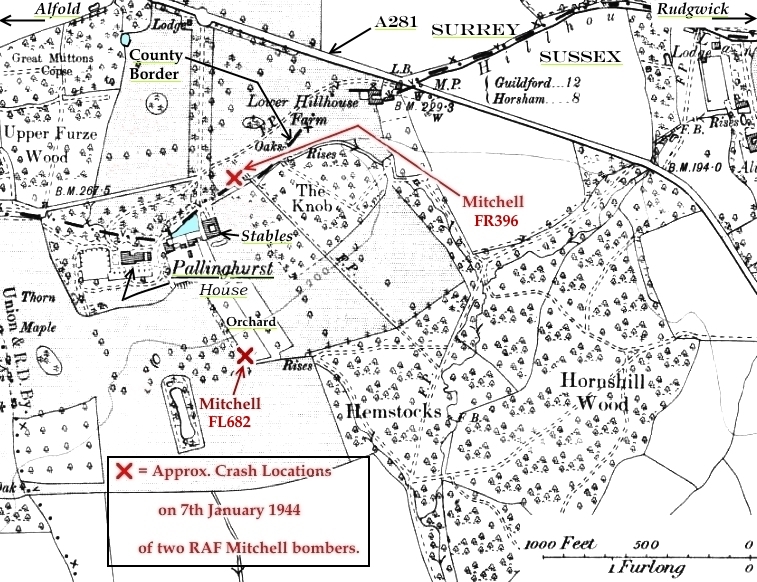 “One day I shall never forget (7th January 1944) Mitchell bombers were returning to Dunsfold on an operational flight, but, unable to find the target had bombs on board. Two collided over Pallinghurst, one crashing in front (actually behind and south-east) of Pallinghurst House, the other one by the stables. The bombs fell out of the plane and landed in a field close to my father. He fell behind a tree which took most of the blast. Mr MacAndrew’s daughter [Kitty (Katherine Flora Lund)] was blown into the pond and received a cut on her leg, but all the airmen died. A few years later, when we were settling down once again, Mr MacAndrews decided to plant some rhododendrons near where the plane had crashed. My brother, now home from the RAF, was the Head Gardener, and he and the other gardeners planted them”. Witness: – Mel Reynolds, (a 5 year old boy), standing at a Tismans Common (¾ mile to the south-east) with a group of 3 other children. He was told, at the time, that the aircraft were returning from a raid on the German Forces in France and one of the aircraft had been badly damaged. Two other aircraft were in close formation with it escorting it back to Dunsfold. 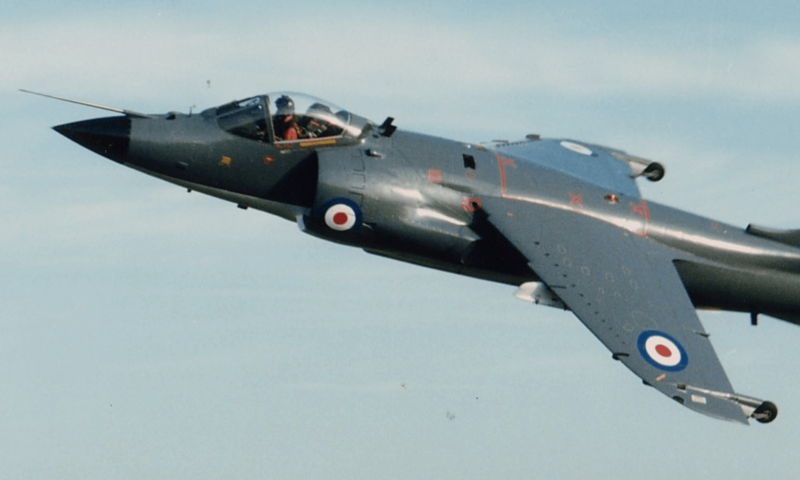 Just before streaming in for the landing at Dunsfold he vividly recalls seeing the damaged aircraft dip and touch wings with one of the others and then one went one way and the other went the other both spiralling down out of control. He saw one aircraft crash followed by a very large explosion which he said shook the ground. (Both the aircraft were in two separate six aircraft box formations and were not escorting any damaged aircraft: – 180 Sqdn. ORB “Aircraft FR396 was returning from an operation flying in box of six aircraft when it collided with Mitchell FL682 of No.98 Sqdn. in another formation. Both aircraft crashed, FR396 diving straight into the ground”). 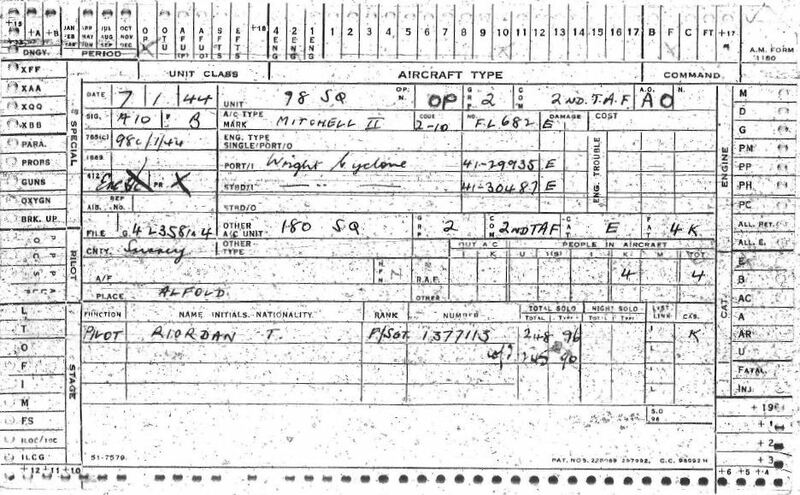 Above: – MoD Air Historical Branch letter identifying a crewman from FL682 at stables crash site. However, subsequent investigation seems to show that the map reference to the stables site (499532) seems to have been used in reference to both aircraft. Above: – Hambledon ARP Log. Above: – Situation Report SE Regional Civil Defence Area. 8 bodies recovered. 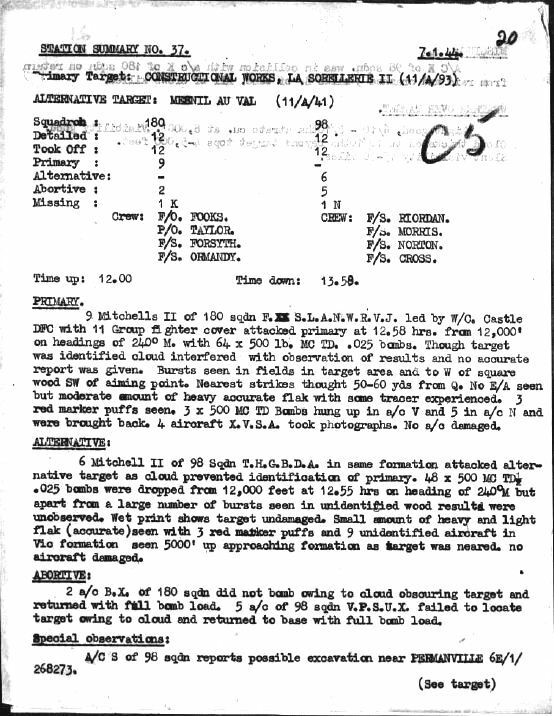 Above: – 98 Squadron Operational Record Book, Summary of Events. Above: – 180 Squadron Operational Record Book, Summary of Events. 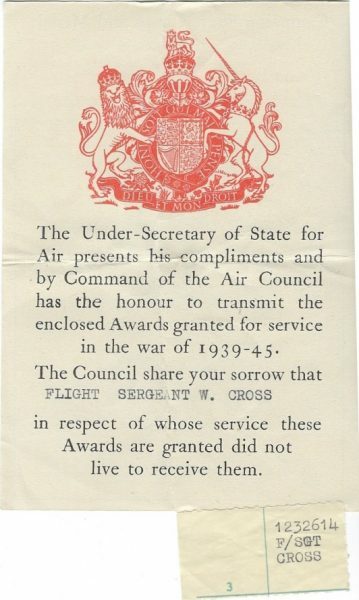 Above: – 98 Sqdn. Operational Record Book, Record of Events 7/1/44. Transcript of 98 Sqdn. ORB, 7/1/44. 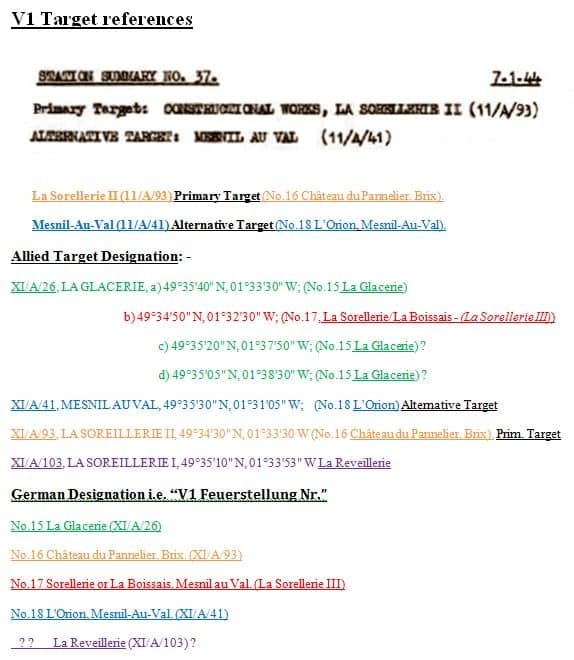 Operations on La Sorellerie II. 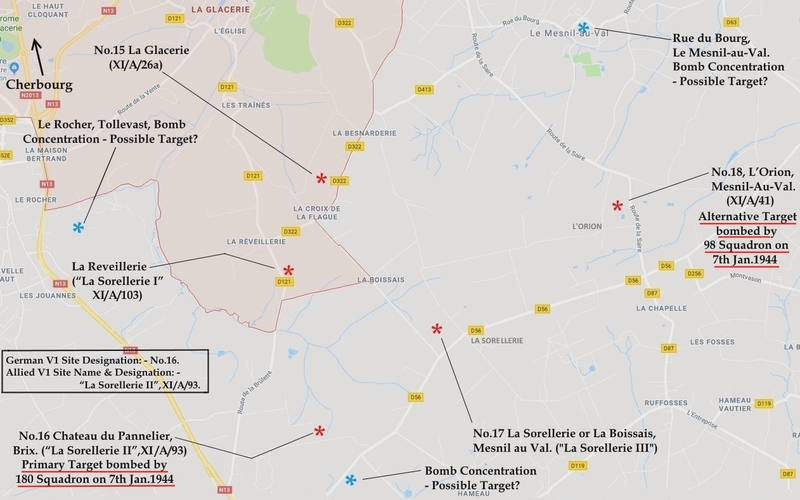 Alternative – Mesnil Au Val which was attacked by F/L. Wilson’s box. 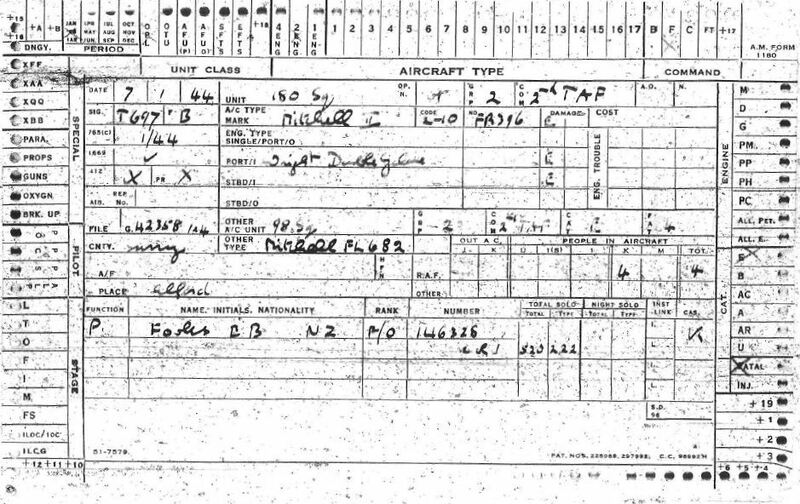 A/c “N” of 98 Sqdn was in collision with a/c “K” of 180 Sqdn on return from the raid and crashed 3 miles S. of base. All of crews killed. 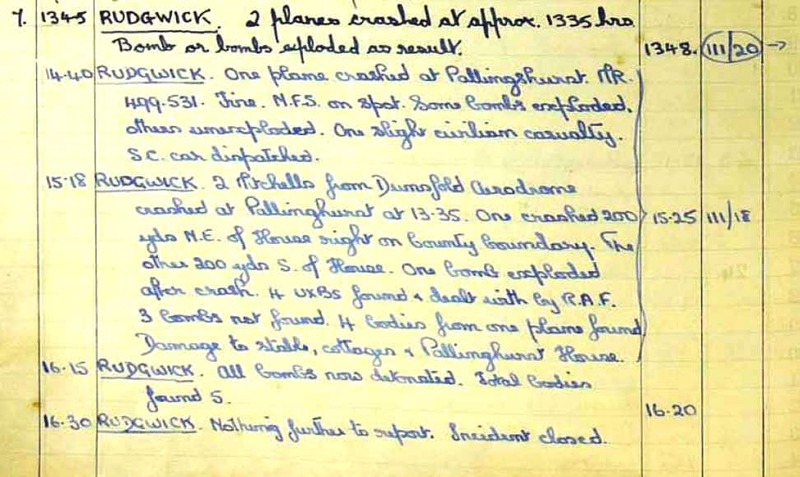 Above: – Station (RAF Dunsfold) Summary of Events 7/1/44. 13.45 RUDGWICK 2 planes crashed at approx 13.35 hrs. Bomb or bombs exploded as a result. Region notified at 13.48. 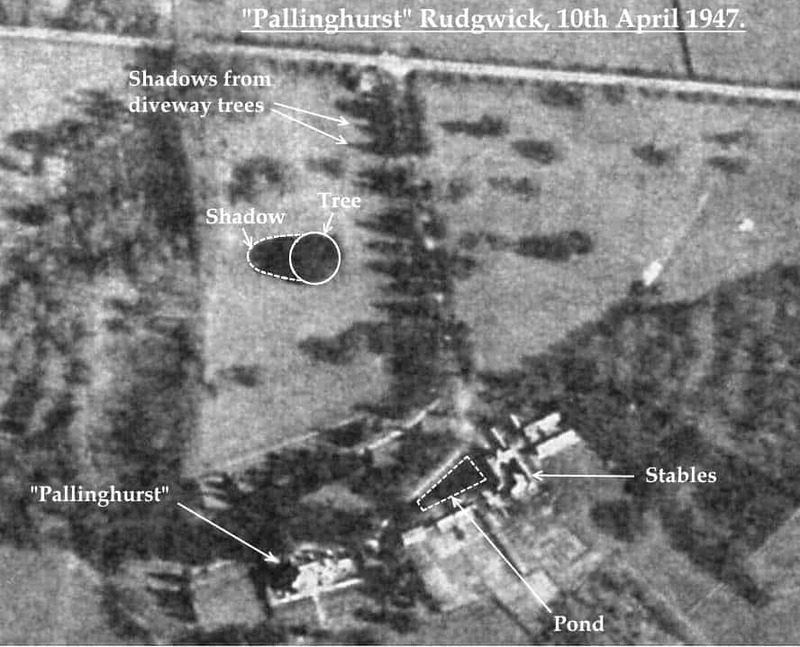 14.40 RUDGWICK One plane crashed at Pallinghurst Map Ref. 499-531. Fire. N.F.S. on spot (National Fire Service). Some bombs exploded, others unexploded. One slight civilian casualty S.C. (Sitting Cases) car dispatched. 15.18 RUDGWICK 2 Mitchells from Dunsfold Aerodrome crashed at Pallinghurst at 13.35. One crashed 200 yds NE of the house right on the County boundary, the other 200 yds S of the house (actually SE of house). One bomb exploded after crash. 4 UXBs [unexploded bombs] found and dealt with by RAF. 3 bombs not found. 4 bodies from one plane found. Damage to stables, cottages and Pallinghurst House. Region notified at 15.25. 16.15 RUDGWICK All bombs now detonated. Total bodies found 5. 16.30 RUDGWICK Nothing further to report. Incident closed. Mitchell II, FR396, Code letter ‘K’, pilot F/O Fooks, 180 Squadron. Flight time: – 1hr. 45mins. Accident time: – 13:33. F/O Fooks: – Total Flying Hours: – 520. Total Flying Hours on Type: – 222. In formation collided with Mitchell of other formation. Pilot following leader (of “Blue” box formation) – leader PCM (?). If gunners had left microphone on, warning could have prevented accident. Leader did not follow plan. Broke away too early. CoI Recommendation: – Stricter control of a/c near drome. Orders given for gunners to leave microphone on. 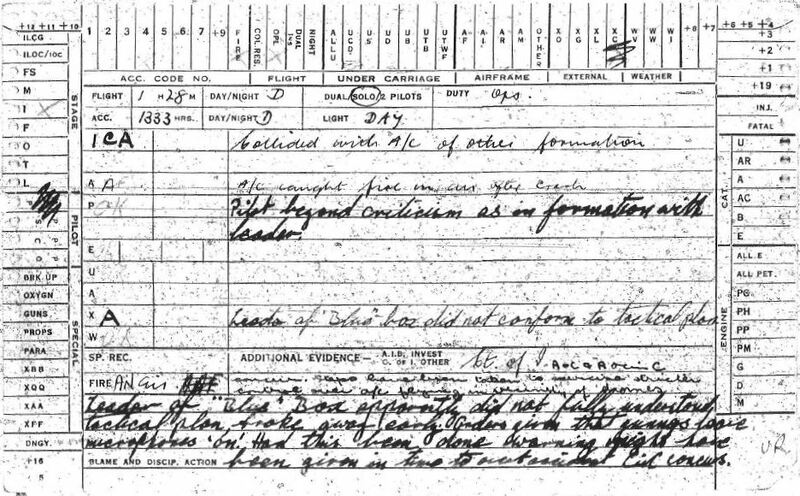 Above and below, Aircraft Accident Report cards for Mitchell II, FR396, Code letter ‘K’, pilot F/O Fooks, 180 Squadron. 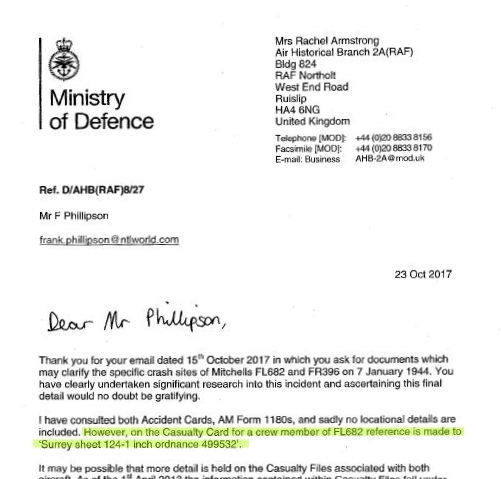 Mitchell II, FL682, Code letter ‘N’, pilot W/O Riordan, 98 Squadron. Flight time: – 1hr. 28mins. Accident time: – 13:33. W/O Riordan: – Total Flying Hours: – 245. Total Flying Hours on Type: – 90. Collided with A/C of other formation. A/C caught fire in the air after collision. Pilot beyond criticism as in formation with leader. Leader of “Blue” box formation (180 Squadron) did not conform to tactical plan as he didn’t apparently fully understand it, and so broke away too early. Orders that gunners leave microphone ‘on’. Had this been done warning might have been given in time to avert accident. Steps have been taken to exercise stricter control over a/c flying in the vicinity of dromes. 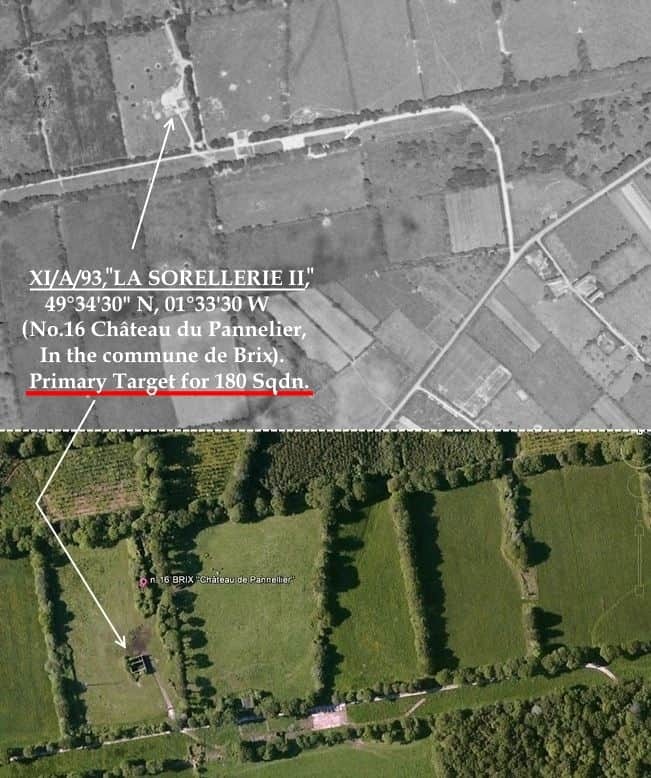 It would seem that with Riordan’s aircraft FL682, which caught fire in the air, is the most likely candidate to be the aircraft that crashed in a fairly flat manner and burst into flames 200 yds south-east of “Pallinghurst” in an orchard. If so, then Fooks’ aircraft FR396 is likely to be the one that dived straight into the ground 200 yds north-east of “Pallinghurst” on the County Boundary near the stables. 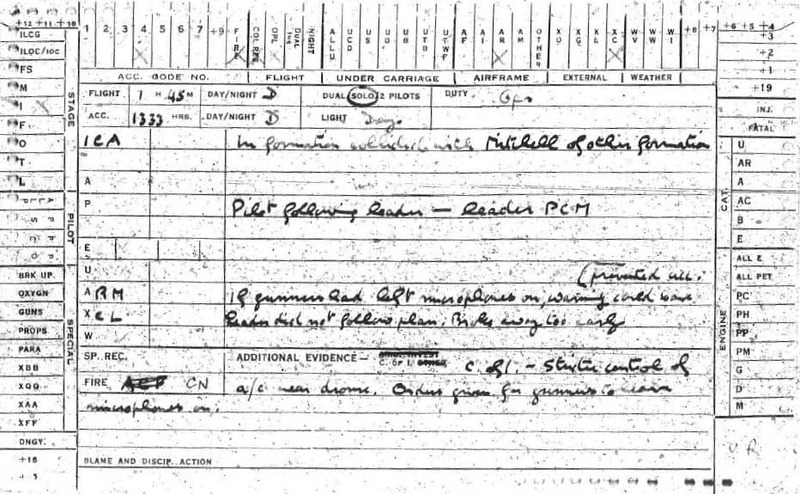 Above and below, Aircraft Accident Report cards for Mitchell II, FL682, Code letter ‘N’, pilot W/O Riordan, 98 Squadron. 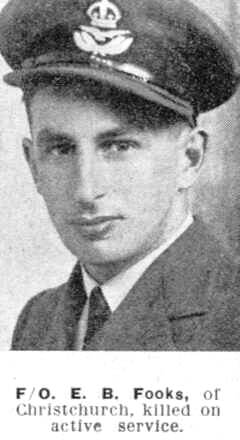 Pilot Officer Leonard Taylor, navigator, 24, from and Buried in Birmingham. 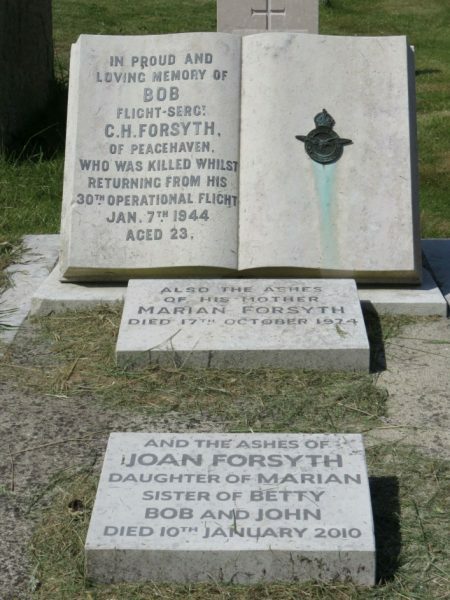 Flight Sergeant Charles Forsyth, wireless op/gnr, 23, from Peacehaven, Buried Newhaven. 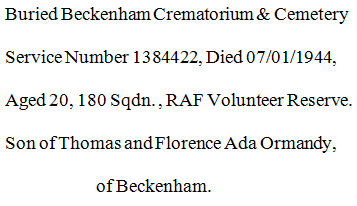 Flight Sergeant George Ormandy, gunner, 20, from and Buried in Beckenham. 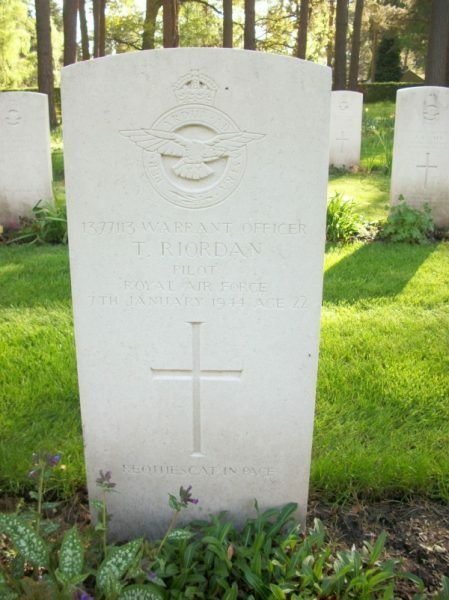 Warrant Officer Terence Riordan, pilot, 22, from Abergavenny, Buried at Brookwood. 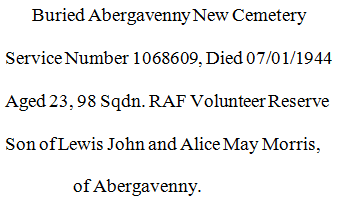 Flight Sergeant Douglas Morris, navigator, 23, from and Buried in Abergavenny. Flight Sergeant Stanley Norton, wireless op. /gnr, 22, from and Buried in Lincoln. 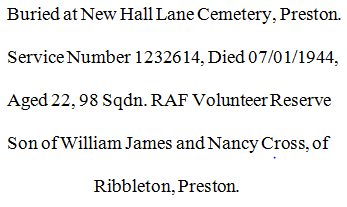 Flight Sergeant William Cross, gunner, 22, from and Buried in Preston. Flg. Off. 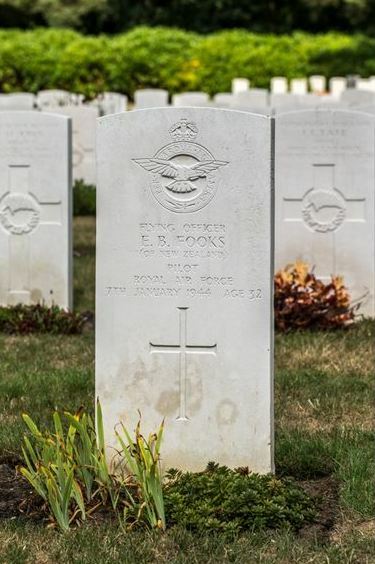 Ernest Berjeu FOOKS, Pilot, from New Zealand, (Mitchell FR396 of 180 Sqdn). Buried at Brookwood Military Cemetery 2. B. 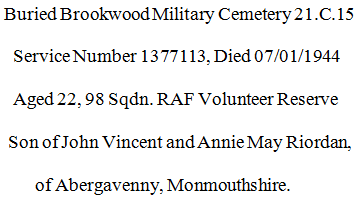 1, Service Number 146328, Died 07/01/1944, Aged 32, 180 Sqdn. RAF Volunteer Reserve, Son of Alfred Augustus and of Adele Catherine Fooks, of Christchurch, Canterbury, New Zealand. 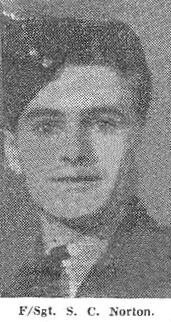 Brother P/O Harry Gordon Compton Fooks RNZAF killed on 21/7/1941 in crash at Marcham, nr. Abingdon, Berkshire on training flight in Armstrong Whitworth Whitley V, N1527, with No.10 OTU at RAF Abingdon. Plt. Off. Leonard Augustus TAYLOR Navigator (Mitchell FR396 of 180 Squadron). Buried Brandwood End Cemetery, Birmingham. 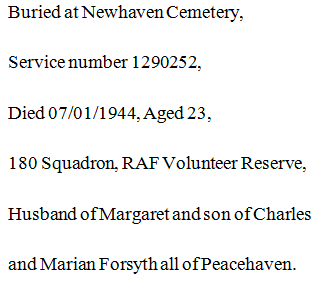 Service Number 168632, Died 07/01/1944, Aged 24, Son of William and May Taylor, of Small Heath, Birmingham. Flt. Sgt. Charles Henry FORSYTH W/Op.AG (Mitchell FR396 of 180 Squadron). Killed while returning on his 30th Operational Flight (the last of a Tour of 30 flights). Flt. Sgt. 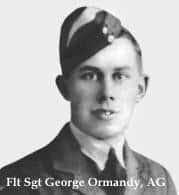 George ORMANDY, Air Gunner, (Mitchell FR396 of 180 Squadron). 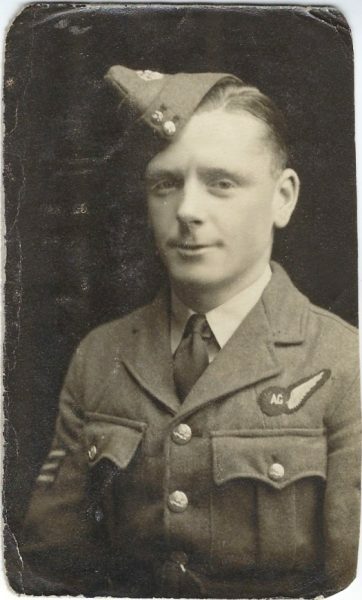 Flight Sergeant Douglas MORRIS, Navigator, (Mitchell FL682 of 98 Squadron). Flt. Sgt. 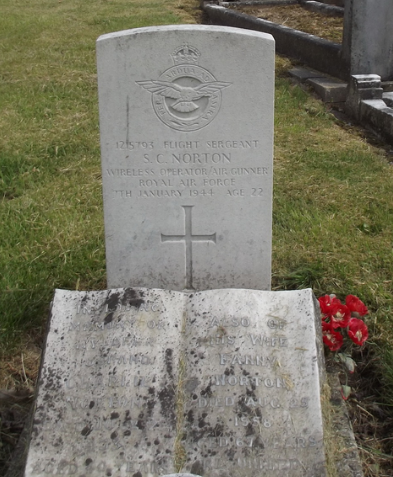 Stanley Charles NORTON, Wireless Op/Air Gnr, (Mitchell FL682 of 98 Sqdn). Photo of Flt. Sgt. 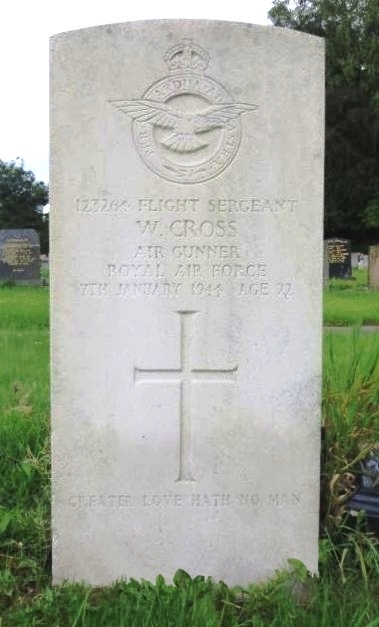 William Cross – Courtesy Arthur Burns. 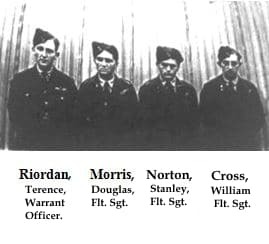 Crew of Mitchell FL682 of 98 Squadron. 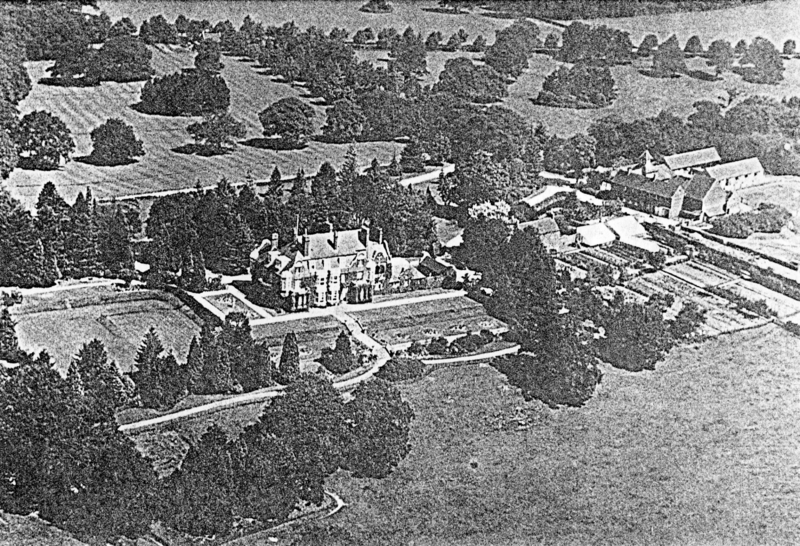 “Pallinghurst” (shown below in 1930 from the air) looking north east, had a very productive garden and orchard (to the right, with the timber-framed Garden House, where the head gardener lived, and (white) glasshouses for peaches and grapes as well as bedding plants and flowers, in line with the other buildings. The park landscape and avenue to the main road are shown clearly, as is the foreground planting that keeps the view from the house open to the southerly view. On the left is the tennis court. The stables on the right would have been home to a dozen or so hunters. The lodge, just visible in the background was home to the head chauffeur. Some oak trees visible at the top of the drive were ‘county oaks’ marking the boundary, thought not to be there now. To the left, just off the picture was the wild garden, woodland managed for attractive walks along the rides. 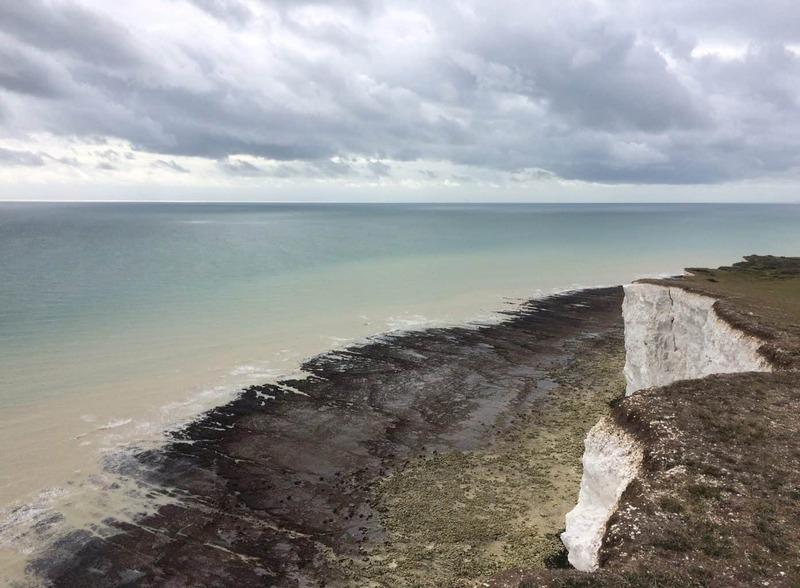 An enquiry came into the Society for information about a B-25 that ditched in the sea off Beachy Head in 1944. 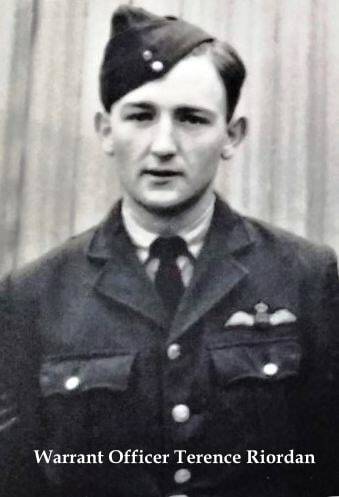 Flight Officer Hodder had survived being shot down and his family were researching the details. There were no known pictures of his aircraft Daily Delivery. We managed to trace Daily Delivery (photo below) but the crew was not F/O Hodder’s crew. This photo was taken a few weeks before the crash, but further research by colleagues of DAHS determined that the 180 Squadron crews rotated aircraft as operational restrictions dictated. So the question was which aircraft was ditched in the sea? F/O Hodder’s later memoirs of the event are written below, with the Squadron ORB recording the official account.